Former Cuban National player Ozz Borges of Hermosa Beach, left, competed in the 59th annual Men’s Laguna Open volleyball tournament in 2014. Expect crowds for the 63rd tournament this weekend. 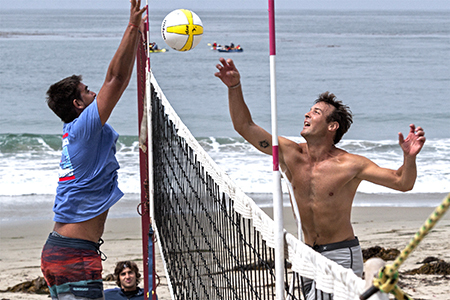 The 63rd Laguna Open Men’s Beach Volleyball Tournament returns to Main Beach at 9 a.m. on Saturday and Sunday, June 3 and 4. Six of the top 20 teams from the first two pro tournaments of the year are signed up to play. Thirty two top-rated AAA and pro men’s teams will battle for a $5,000 purse, valuable seeding points and the right to get their name on the perpetual trophy. Laguna locals won in 2016 for the first time in years when Chase Frishman and Mike Brunsting beat Miles Evans and Spener McClachlin in a thrilling final. They are returning to defend their title. Sean Rosenthal and his partner Trevor Crabb have signed up. Rosenthal’s fan base, known as “Rosie’s Raiders,” promise to bring a lot of energy to the tournament. London Olympic gold medalist Reid Priddy and his partner Madison McKibbin have entered following their strong fifth place finish in a tournament in Austin, Tex. Another fifth place team from Austin tournament, Ed Ratledge, the 2015 Laguna Open champion, and Eric Zaun, have also signed on. The Laguna Open tournament is run entirely by volunteers in association with the California Beach Volleyball Association, and in cooperation with the city of Laguna Beach. It is free to the public, kid friendly and features music and world-class volleyball. This year’s tournaments will feature the debut of perpetual trophies and the men’s trophy will be dedicated to the late Gene Selznick, who won the first seven tournaments. The Laguna Open tournament committee will sell all the seeded teams in men’s and women’s tournaments with all proceeds going to the athletes, organizer Kirk Morgan says. More info: [email protected].